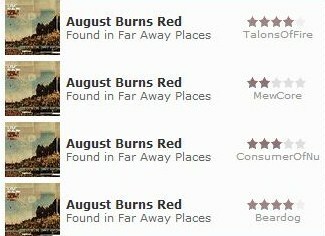 Review Summary: August Burns Red continue forging their own path. Other differences crop up with the only use of clean vocals, courtesy of a guest appearance from A Day To Remember’s Jeremy McKinnon. He appears for a quick chorus to brighten the melancholic, brooding “Ghosts.” The main change Found… makes apparent throughout the exhausting listen is a darker tone and more varied tempos. “Broken Promises” and “Vanguard” are among their longest cuts to date, scaling back on the aggression for a more mid-tempo, moodier effect. “The Wake” features most of what the album has to offer, however. The rapid-fire opener begins with chromatic guitar riffing all over the fretboard alongside furious drumming, which throughout the album manages to sound like something from a melodic death metal band. A breakdown follows, and then a tapping guitar solo. It serves as a familiar display of their sound, and of what the album contains overall. It doesn’t take long for August Burns Red to start showing their best qualities, however. Lead single “Identity” features the usual effective lead guitar harmonies, soloing, and heavy riffing before a quieter, atmospheric passage with a climbing bassline and quiet guitar strumming takes over, eventually climaxing with a beautiful classic rock sounding solo. Found… continues the increased use of strings, acoustic guitar, and other various instruments similar to Rescue & Restore. They’re a welcome change of pace, but the most impactful moments are largely on their established strength as song writers. “Majoring in the Minors” and “Everlasting Ending” carry the weight of the album, with heartwrenching vocal and guitar performances that end up being among the most impactful of their career. It’s a veritable strength of August Burns Red to keep improving their furious modern metal sound with the weight and passion always existing behind the whole formula, with crushing guitar riffing, beautiful melodic passages, and a profound meaning weighing behind the musical backdrop. If I didn't know any better I'd say there's a new August Burns Red album coming out! Awesome work! I liked Rescue and Restore, so I guess I'll have to check this. @Sowing what made you think that? Great review man, have a pos. "Welcome change of peace"... Still a great review! Jesus, the reviews for this today lol. Pos though, great review. I might just check it out. Thanks everyone, and congrats to me for my 40th review on the site. Still awesome rev talons! Sounds like I wouldn't love this though. Thanks Mong, and you might like it, though you never struck me as much of a metalcore fan. This is the first well-written review of this. Nice job. haven't checked the album yet, but this is nicely penned. pos'd.